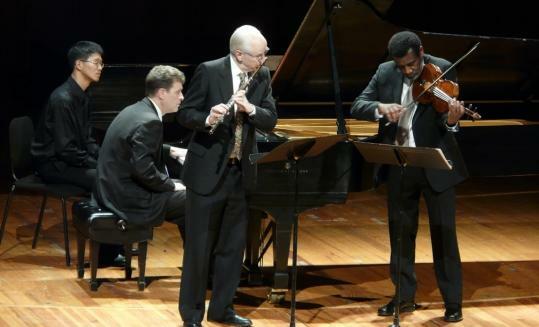 Pianist Randall Hodgkinson, flutist Fenwick Smith, and violist and artistic director Marcus Thompson perform in MIT’s “Musical Time’’ concert Saturday night at Kresge Auditorium. CAMBRIDGE - It’s often been said that a composer is like a painter whose canvas is time. But the composer’s internal clock seldom matches our own, and music makes its impact in part by organizing, reshaping, or exploding our own notions of time. The complex interplay of music and time has been the subject of academic monographs, poetry, and even musical compositions themselves. As it happens, it is also the focus of a winter festival currently underway at MIT. Presented by the Boston Chamber Music Society and MIT’s music and theater arts faculty, “Musical Time’’ opened over the weekend and continues on Jan. 16 and 23. Each installment includes an interdisciplinary panel discussion and a concert with both newer music and standard repertoire touching directly on the festival’s theme. On paper, and indeed in its execution, judging from this past Saturday’s events, “Musical Time’’ is the most imaginative, most ambitious and most rewarding programming that the Boston Chamber Music Society has offered in recent years. Hats off to the organization’s new artistic director Marcus Thompson. A festival of this nature should undoubtedly become an annual BCMS tradition. Taken on its own terms, Saturday evening’s performance would have been a richly satisfying evening of chamber music. But the concert was introduced by a wide-ranging panel discussion with composer Libby Larsen, music historian Michael Scott Cuthbert, theater designer Sara Brown, and physicist Robert Jaffe, whose explanations of subatomic and cosmological time provided a particularly mind-bending context for the discussion of musical time. Armed with an intellectual framework for approaching some unfamiliar music, Saturday night’s audience, with many no doubt used to more typical BCMS concerts that lean heavily on 19th-century masterpieces, listened with intense concentration through a traversal of works by Andrew Imbrie, Larsen, and George Crumb, all of them written over roughly the last 50 years. It helped that the individual performances were so compelling. Eloquent contributions from Fenwick Smith (flute), Thompson (viola), and Randall Hodgkinson (piano) brought out the rugged sincerity of Imbrie’s Serenade. Larsen’s vividly etched and warmly lyrical “Black Birds, Red Hills’’ (with clarinetist Thomas Hill joining) also benefited from screen projections of the paintings by Georgia O’Keeffe that had inspired the different movements. Even Crumb’s “Eleven Echoes of Autumn, 1965,’’ which quotes Lorca’s description of “the broken arches where time suffers,’’ did not seem to faze listeners despite its menagerie of strange instrumental effects, with Ida Levin for instance bowing near her violin’s scroll. After intermission, cellist Astrid Schween joined for a forceful, high-energy account of Ravel’s Piano Trio. Cuthbert had pointed out structural ways in which the composer here manipulates our expectations of time, but I was also aware of how thoughtful concert programming can itself alter notions of historical time and distance. In this case, coming in the wake of the highly fractured Crumb and the other modern works, Ravel’s long-arching melodies felt like messages in a bottle cast off from a distant, prelapsarian past. The piece was in fact begun in 1913, on the eve of the First World War.